Description: Very stylish travel accessory. Open main compartment for storing all travel documents. Multiple pockets for passport, tickets, itinerary, credit cards and business cards. Black leather. Features: Two large side pockets for currency. Flap over protection pocket secures credit cards and currency. 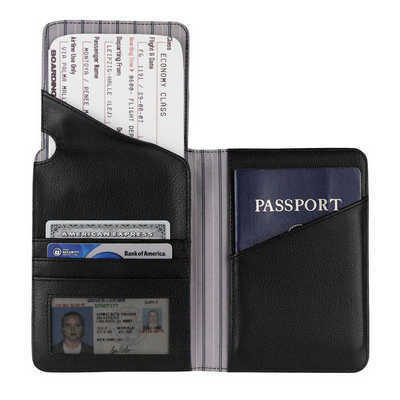 Quick-access front pocket for passports and documents. Includes 1-piece Cutter & Buck® gift box Packaging: Includes 1-piece Cutter and Buck gift box Colour: Black. Material: Leather Product Size: 150mm(h) x 110mm(w) x 12.5mm(d) Freight details : 40 per carton, 7kgs, 31 x 26 x 37cms; Decoration Type(s): Colour Print / Deboss / Debossed Foil / Foil Stamp / Full Colour Print Decoration Area: Pad/Screen/Emboss: 60mm(h) x 50mm(w). Price includes : 1 Colour 1 Position Print. Setup is included.